There are many reasons why you may require tooth extractions. Your tooth may need to be pulled because of trauma or decay. 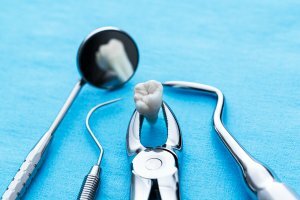 Often, tooth decay can be fixed with a deep cleaning and a filling or crown for protective measures, but if a tooth has extensive damage that cannot be repaired, it may need to be extracted. A severe tooth infection may also require an extraction. If the infection spreads to the tooth’s pulp, not only will you have a very painful toothache, you’ll also most likely need to have the tooth pulled. In some cases, a dentist can remove infection through a root canal, but if this procedure doesn’t work, the tooth needs to be removed to prevent the infection from spreading. If you suffer from any of these issues, you’ll want to consult with a dentist. Leaving an unhealthy or problematic tooth in your mouth can cause a variety of issues. There are two different types of extractions. To determine the best removal option, a dental specialist will take x-rays of your mouth. The first type of extraction is a simple extraction. This procedure is typically performed using a local anesthetic to numb the area. If the tooth is healthy and visible in the mouth, it can be more easily removed. Your dentist will use a tool known as an elevator, which loosens the tooth. Once loosened, the tooth can be easily removed. Other tooth removal procedures are performed through surgical extraction. This is more complicated. If the tooth is beneath the gum line or impacted, you’ll require oral surgery. With surgical extraction, the dentist makes a small cut in the gum to remove the tooth. During the procedure, you’ll receive a local anesthetic and possibly anesthesia. After an extraction, you’ll want to follow the instructions given to you by your dentist. Apply an ice pack to your facial area. Take over-the-counter painkillers, such as ibuprofen. To keep your mouth clean, we most likely will prescribe a mouth rinse called Chlorhexidine. Avoid harsh swishing, as it can re-open your gum line incision. Everyone heals differently, but you can expect to be back to normal after a few days up to two weeks. For all of your dental needs, including tooth extractions, finding a reputable dental clinic is a must. At our clinic, we use the best dentistry tools available. You can also count on us to answer any of your dental questions or concerns. We even offer various forms of financing so this may help you budget and allow you to get the treatment needed to keep your teeth healthy. If you’re in the Mountlake Terrace area, Emerald City Smiles is the dental office for you! Schedule an appointment today by calling us at (425) 775-3446.